A Harriet Williamson pick for best summer reading. One August day, veteran Marcus Eriksen set off on a journey down the entire length of the great Mississippi River on a homemade raft kept afloat by 232 empty soda bottles, recycled junk, and a dose of ingenuity. Though he had never made such a trip before 2,000 miles from Lake Itasca, Minnesota, past his childhood home near New Orleans, to the Gulf of Mexico he had dreamed of doing it over a decade earlier, while serving amid sandstorms and oil fires in Kuwait as a marine in the Gulf War. 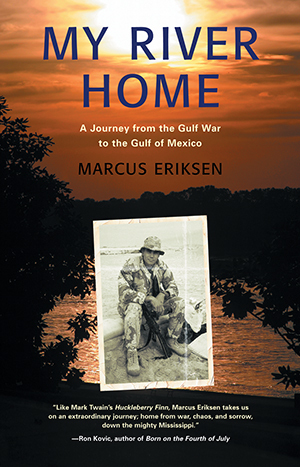 While struggling against a river with an unpredictable personality, Eriksen recounts a personal shift from proud soldier to self-destructive veteran to engaged activist protesting the injustices of the Iraq War. Startlingly honest and warm with affection for the people he meets, in My River Home Eriksen explains, through his own story, the allure of the military, the tragedy of modern war, and the courage it takes to fulfill a dream.